Sometimes, when I’m dipping back into the archive to select something for blog-i-fication, I let my mood steer me wherever it wants. If I’m feeling like some sunshine pop, then sunshine pop you shall have. However, sometimes, and it’s not often, which is why it bears explaining, my head and my ears get all crossed up and I must, without any doubt, whip a little skronk on you. What is being with that? I’m not sure where I picked that particular word up, but the best guess is sometime back in the old print-shop zine days. The definition, if not self explanatory, is thus: loud, aggressive, noise, presented of course in some form of musical context. Early Stooges? Skronk for days. Blue Cheer, Sabbath, some of your rougher, more primitive six-teez ponk zounds? Skronk-tastic. I was momentarily poleaxed, and then excited, since this especially tasty, extremely weird chunk of psychedelic hippo stomp was sitting on the flipside of what could be described simply as a twenty-five cent garage sale wonder. 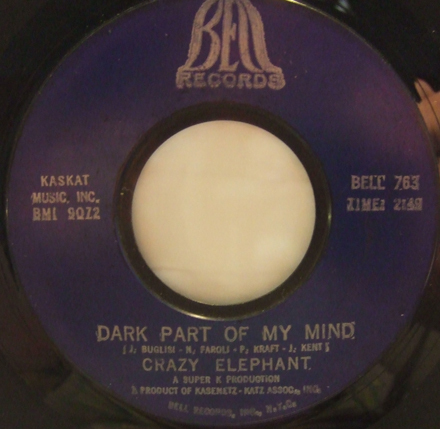 Turn over ‘Dark Part of My Mind’ and what you get is Crazy Elephant’s (another cog in the Kasenetz-Katz factory of wonderfulness) 1969 AM radio smasheroo ‘Gimme Gimme Good Lovin’, which is in and of itself a very nice bit of soulful rock, often mischaracterized, thanks to its provenance as ‘bubblegum’, which it ain’t. That ‘Dark Part of My Mind’ is not at all like it’s musical Siamese twin may or may not have something to do with the assembly line nature of its birth. 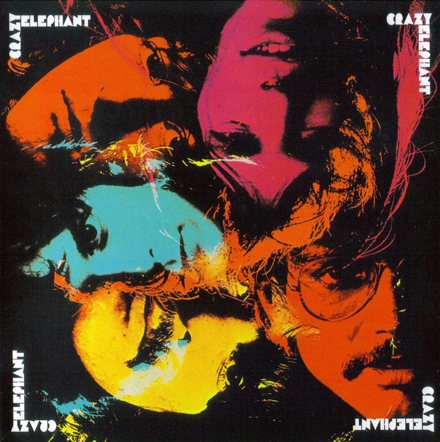 Was Crazy Elephant a psyche band that got squeezed into a poppier vibe for it’s 45? Were they a pop band that got dosed and went nuts in studio? Were they even a band in the real sense? Or was ‘Dark Part of My Mind’ a perverse joke of some kind, hidden on the B-side of a pop record, meant to freak out the squares when they least expected it? Like the owl in the Tootsie Pop commercial, I must state that the world may never know. And in the end, it doesn’t matter. The uniqueness of the song (which also appeared on the flip of a 45 by Captain Groovy and His Bubblegum Army) makes it a kind of sui generis bit of madness, known by few, but worshipped by those that know. PS Head over to Funky16Corners for a funky new mix. a few years further down the line into Hippie-ville. I love digging for records, but what I love even more is finding a record, digging for some info and discovering a whole new back alley, ripe for exploration. The record I bring you today is a very recent acquisition, grabbed off of Ebay from a friend’s list, solely on the basis of the fact that it was a non-soul 45 on the storied Mirwood label. 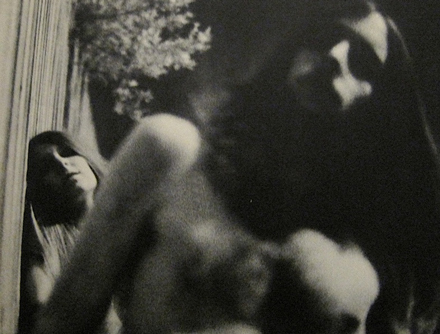 Mirwood, and it’s sister label Mira operated out of Los Angeles from the mid to late 1960s. Mirwood was mostly devoted to soul and R&B, Mira mostly to pop and rock. Both labels had a smattering of the other’s stock in trade, but by and large they did not stray from their chosen style. However, when they did (for no real reason that I know of) the results were often very cool. I’d make an educated guess and say that this probably had more to do with an intersection of geography and zeitgeist, i.e. LA at mid-decade could not be – as the kids say – fucked with. There was so much fuzz, jingle jangle, granny glasses and nascent flower power that almost everything heated in that particular crucible had something cool about it. 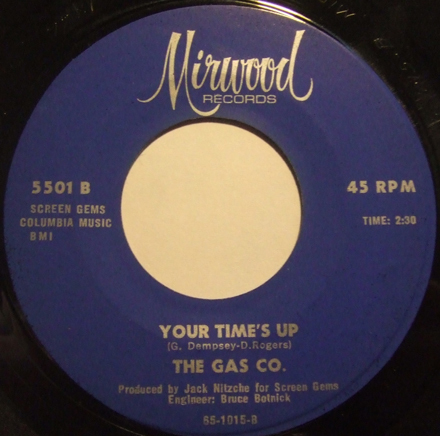 So, that’s explains why I bought ‘Your Time’s Up’ by the Gas Co. (the very first record released on Mirwood) without having heard a single note. Of course when the record fell through the mail slot and onto the turntable, my ears started to tingle, since what I was hearing was Grade A Prime, number one, high quality, furry vest and pageboy Sunset Strippery. None of the names on the label rang any bells, so I set off into the wilds of the interwebs, and before you know it I find out that the man behind the Gas Company, Greg Dempsey has himself a very interesting history. I’ve gone on at length in this space about my worship of the one Leon Russell, and as it turns out, Greg Dempsey was an old buddy of Leon’s (and Bobby Whitlock, Carl Radle, Jesse Ed Davis and JJ Cale) from way back in the Tulsa, Oklahoma days. At some point in the mid-60s, Dempsey headed west (as did many of his homeboys) with his partner Kathy Yesse (later Kathy Dalton*), where the two of them formed the Gas Company. As ‘Your Time’s Up’ displays, they had a healthy dose of Sonny and Cher in the mix. Those who say that the similarities have more to do with common roots than pure imitation might have a point, but there are sounds herein that at least to me point directly toward Mr. & Mrs. Salvatore Bono. This is not to diminish the coolness of ‘Your Time’s Up’, since what we have here is a stunning slice of jangly, punky 1965 Sunset Strip wonderfulness. I mean, honest to god, were you to imagine a band conjured up for a period TV show character’s trip to the Strip, you could not do better that the Gas Company. And it was produced by the mighty Jack Nitzche! 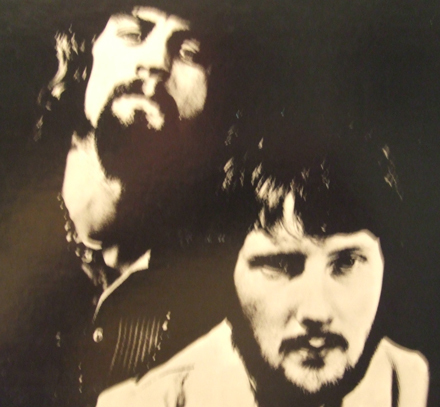 Dempsey and Yesse went on to record four Gas Company 45s (one for Mirwood, three for Reprise) between 1965 and 1967, before evolving into the Daughters of Albion (pictured above), and recording an album under that name for Fontana (produced and arranged by Leon Russell) in 1968. 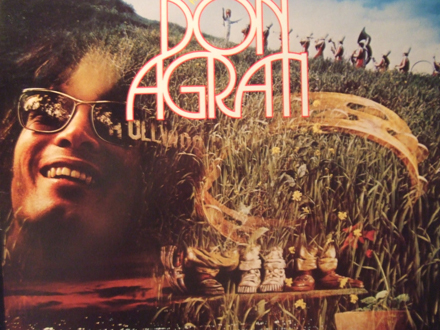 Dempsey also had some success as a songwriter, co-writing Don and the Goodtimes’ ‘I Could Be So Good For You’ (with Nitzche) and ‘Prince of Peace’ and ‘Roll Away the Stone’ (both with Leon Russell) from Russell’s first solo album. Now all I have to do is find those Reprise 45s…. PS Head over to Funky16Corners for a funky cover of a very familiar song. I’m back for another week in the revivified universe of Iron Leg. The tune I bring you this week is something that I’ve had, and dug for close to 25 years. 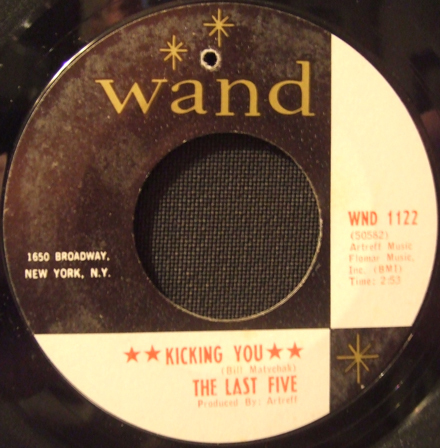 I don’t recall where I picked up ‘Kicking You’ by the Last Five, but I suspect it was at a record store that has changed locations twice in the decades since, getting less appealing (and more poorly stocked) with each move. This was a store that used to be overflowing with old 45s, and was also rumored to have a basement full of unexplored stock (which no one ever got access to). This was back in the days before I went out digging with a portable, so I can say with confidence that I grabbed this one because it looked interesting. Good thing too, because when I got home I discovered that it sounded cool too, which is important, especially when you’re dealing with records. The tune, ‘Kicking You’ has a cool, folky, pre-fuzz garage sound to it, much more Beau Brummel-y than Standell-ish. I can definitely picture these guys in matching suits and longer hair than some, but not long enough to get their asses kicked out behind the American Legion. But, it’s all speculation, since in the quarter of a century since I first found this record, all I have ever been able to find out about it (aside from the fact that it was released in 1966, which was the easy part) was that the band came from Connecticut. I remember finding a mention on a message board a few years ago from someone that remembered the band, but that seems to have been scrubbed from the net (proof that not everything on the internet lasts forever). If any of you fine people have any additional information about (or even pictures of) the Last Five, please drop me a line. Other than that, dig the tune, and I’ll see you all next week. PS Head over to Funky16Corners for some funky sax-o-ma-phone. Got the sad news this week that the great Gerry Rafferty had passed away at the age of 63. Rafferty’s music was a major fixture on AM and FM radio when I was a kid, first as a part of Stealers Wheel (‘Stuck In the Middle With You’) and later with huge solo hits like ‘Baker Street’. As the years went on, I discovered that Rafferty had had a much longer and more interesting career than I originally thought, having played and recorded with a young Billy Connolly in the Humblebums, and later working with Richard and Linda Thompson. I’m republishing this post (originally up in May of 2010) so you can check the group out, and remember Gerry Rafferty. PS Head over to Funky16Corners for a reggae version of a soul classic. The Iron Leg has returned, hopefully for the long run. It seems likely that for a while anyway, I’ll be sticking with one post a week augmented with the occasional Iron Leg Digital Trip mix, but at least I’ll be able to share some groovy stuff with you all. An important note, I’ll be taking part in the Spindletop night with DJ Perry Lane next Monday night, beginning at 10PM at Botanica, 47 East Houston Street (between Mulberry and Mott) in New York City. They have a very groovy thing going there so come on down to soak up the Hammond 45s, soul jazz and other swinging sounds. The tune I bring you today is – in it’s original form – a masterpiece of hard edged Motown, as performed and recorded by Chris Clark. 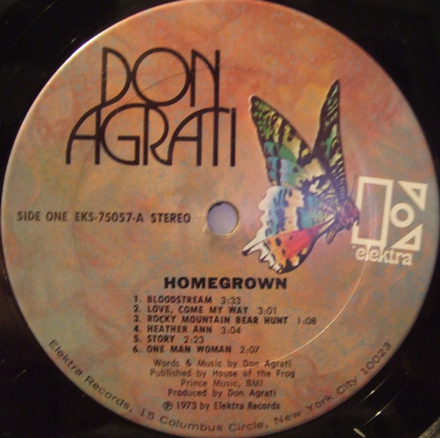 Not long after I scored my copy of that particular record, someone (I do not recall who) informed me that there was a garage band version of the track, which also appeared on the VIP label. At the time I assumed that this was probably unspeakably rare and did not hold out hope that I might snag so scarce a beast, but as its appearance in this space today proves, things often work themselves out over the course of time. 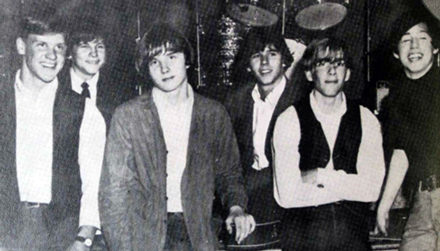 The version I bring you today was recorded in 1966 by a Detroit area band called the Underdogs. 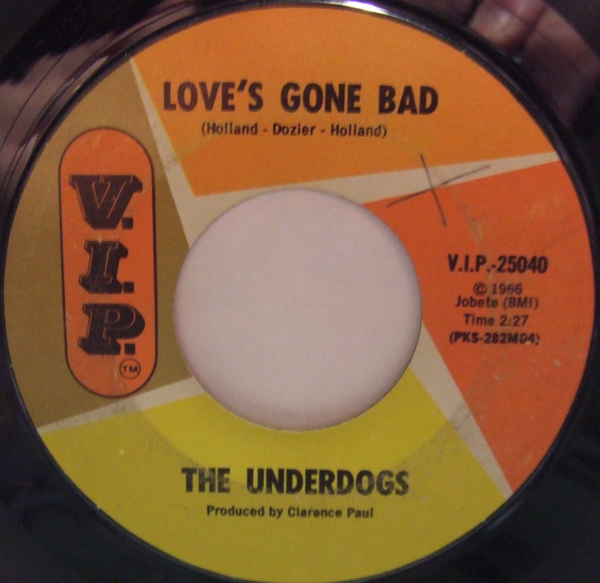 Interestingly, the Underdogs were the first band to record for the stories Motor City garage label Hideout Records (also home to Doug Brown and the Omens and the Pleasure Seekers among others). Composed of Dave Whitehouse (bass, vocals), Chris Lena (guitar), Tony Roumell (lead guitar) and Michael Morgan (drums), the Underdogs, a popular local band were apparently the beneficiaries of a certain Mr. Berry Gordy’s plan to expand into other markets. They had already recorded for Hideout when they went into the studio with Clarence Paul, aided by Earl Van Dyke on piano and James Jamerson on bass. 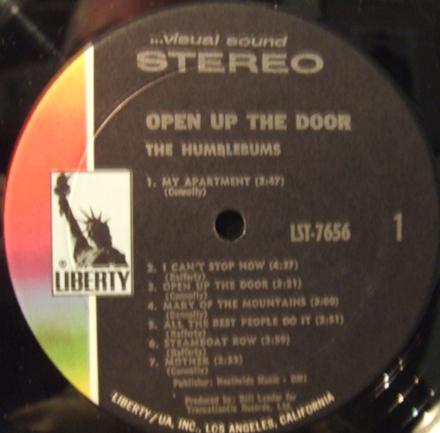 The first time I heard the Underdogs 45, I thought that the two sides came from two different sessions. This is in fact not the case, but the sound of the two songs is different. 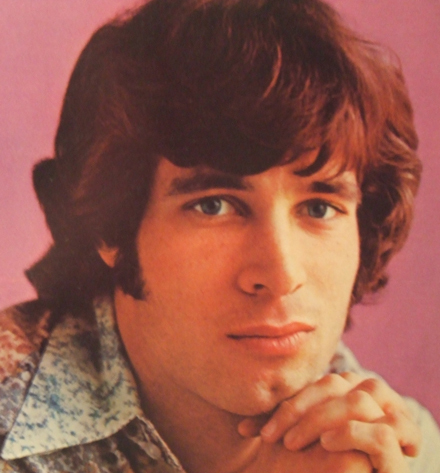 ‘Love’s Gone Bad’ is compared to the Chris Clark recording remarkably spare, and much more what you’d picture a 60s punk band sounding like (aside from Van Dyke’s piano backing). The flip side, a rendering of Henry Lumpkin’s oft covered ‘Mojo Hannah’ (listed here as ‘Mo Jo Hanna’) has a much fuller, more ‘produced’ sound to it. ‘Love’s Gone Bad’ went on to be a fairly substantial Detroit area hit. Apparently the Underdogs went into the studio a second time (with no less a light than Norman Whitfield!) and recorded a cover of the Temptations ‘The Way You Do the Things You Do’ which was unreleased at the time, but later appeared on Motown reissue comps. The Underdogs were reported to record the original version of Bob Seger’s legendary ‘East Side Story’, but Seger decided to keep it for himself, and the rest is history. That all said, ‘Love’s Gone Bad’ is yet another savage example that the good people of Detroit harbored a lot of snotty longhairs amongst their many legendary soul singers. PS Head over to Funky16Corners for a tasty Northern Soul 45.